Today at 2pm, the Seattle City Council will hear a report from the Seattle Department of Transportation (SDOT) on the status of free-floating bikeshare, as the department prepares to begin work on new legislation that will make the pilot program permanent. The report starts with a brief overview of free-floating bikeshare, which I’ll recap as a reminder how quickly this came about. In January 2017, there was not free-floating-based program in the United States. By December 2017, there were five major companies working in 25 cities with 44,000 bikes between them. In spring of 2017, Seattle did not have a bikeshare program after pulling the plug on Pronto. In July of 2017, the city began its pilot program with 1,500 bikes owned by three companies–Lime, Spin, and Ofo–by the end of the year there were 10,000 bikes on the streets, and currently there are 8,600 regular bikes and 1,400 electric-assist bikes. So in less than a year, Seattle went from nothing to 10,000 bikes! July 31st – New permit program in place. As of yet, what the new program and permit system will look like is unknown. We will be sure to cover it when that information becomes available. In the mean time, there is some old quantitative and new qualitative data in the SDOT report. Quantitative Data: Where is 2018? The report, as it turns out, is mostly old qualitative data repackaged with the period covered spanning from July to December 2017. It begs the question, halfway through 2018, why is there no new data? Unfortunately, the report fails to address this in any way. The Urbanist reached out to SDOT and was told that they do not presently have any 2018 data. The pilot program was set up so that the University of Washington processes the bikeshare data provided by the private operators. SDOT gets updates only periodically and apparently none so far during the extension into 2018. Hopefully at some point we can see some updated numbers to judge the program, because much has changed since December for this fast-evolving transportation system. In fact, 2018 data represents nearly half the lifespan of the program. The survey results show that people like free-floating bikeshare, that they are using it, and doing so for a variety of purposes. Overall 74% of respondents had a favorable view of free-floating bikeshare, 33% had tried it, 33% had not tried it but were willing, and 33% were not willing to try it. The percentage of people who have tried it is fairly consistent across racial lines, with 36% of Latinos and African-American respondents and of 32% of Asian-American and Caucasian respondents having tried bikeshare. There is, however, an age and gender divide with most users between the age of 25 and 44 and 62% are male versus 38% female. This is troubling and should be investigated further. To me, it also might have something to do with the lack safe bike routes, those who feel uncomfortable, and unempowered to ride our city’s often hostile streets. Responses show that people are using the program to get to social and leisure activities, errands and appointments, work, and maybe most interestingly, 75% of people used bikeshare to access transit. The things people liked about bikeshare is that it reduces carbon emissions, it’s fun, and you don’t have to worry about getting your bike stolen. The top things people did not like were bikes inappropriately parked, the lack of bike routes, and too many scofflaws. Interestingly, the 85% of comments received via email and phone were unfavorable citing bad or incorrect parking, pedestrian access and safety issues, that the bikes are ugly or clutter, companies being unresponsive, and people who don’t wear helmets. Some of these don’t carry the same weight in my eyes as others. No one complains about cars cluttering our streets and the the evidence on the effect of helmet laws is mixed. During the study period, there were 468,000 trips and five reported collisions and no reported serious injuries, so the helmet issue seems more perceptions than reality. The effect of improperly parked bike does seem like a bigger issue, especially how it effects the disabled (and as a teacher of mine used to say, “we are all disabled, we just don’t know it yet”). Blocked ramps, sidewalks, and transit stops may be minor inconveniences for many people but for others it can pose major mobility issues. Fortunately, the parking study shows that 70% of bikeshare bikes were parked correctly and only 4% were fully blocking access, though that is still too many. The city has begun a pilot project of adding more designated bike parking. This speaks to the general lack of bike infrastructure in the city and the need for more bike parking corrals in general, a solution that would benefit all bike riders. 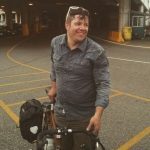 As an frequent bike rider who lives in Southeast Seattle, works in Central Seattle, and spends a fair amount of time in North Seattle, I have seen the growth of floating bikeshare in all parts of the city and witnessed it becoming an integral part of my own transportation. One of the most satisfying things for me to see is how often it is used by people in my neighborhood of Othello, which is not the most bike-friendly part of the city. I just opened the Lime app and there are seven bikes within a few blocks of me, including three electric-assist bikes. In my experience, it seems like it has increased the number of people on bikes and the types of people (by which I mean not spandex warriors, Day-Glo commuters, bike punks, or the usual suspects). I see teenagers riding around my neighborhood, business people riding the Second Avenue bike route, and people out for a cruise on the Burke-Gilman Trail. I use bikeshare almost every time I use transit and I have used it to get to and from work meetings. The quantity, flexibility, and price has made bikeshare accessible in a whole new way. The free-floating bikeshare model has much promise but many issues still. Hopefully the new legislation will address concerns, maintain access for the disabled, broaden the reach of the program to more people, and ensure that if investors panic we aren’t left high and dry. What will ultimately determine the fate of free-floating bikeshare is the same thing that affects all biking: the city’s lack of safe, connected bike infrastructure and the slow walking of the Basic Bike Network. More than anything else, having safe routes connecting all neighborhoods so all people no matter their confidence level can feel secure riding will be what makes us a real biking city. Good point. This weekend I saw a woman ahead of me in a wheelchair utterly blocked by a small board laying across the sidewalk. It doesn’t take much.